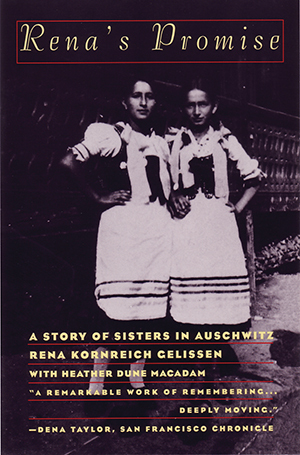 One of the few Holocaust memoirs about the lives of women in the camps, Rena’s Promise is a compelling story of the fleeting human connections that fostered determination and made survival a possibility. From the bonds between mothers, daughters, and sisters, to the links between prisoners, and even prisoners and guards, Rena’s Promise reminds us of the humanity and hope that survives inordinate inhumanity. 1.In the beginning of memoir, the co-author puts herself into the story. Her voice, and narrative flips back and forth between present time and the past then eventually disappears as Rena’s voice takes over. Why do you think the author uses this technique? 2.The narrative voice, for both co-authors, is written present tense. How does writing about Auschwitz in present tense change your perspective on the events you are reading about? 4.Men’s and women’s experiences in the Holocaust varied—what can you attribute to that fact? What would have caused these discrepancies. What do the footnotes say about this information? 5.If you could pick out one theme for Rena’s story, what would it be? What were the key factors that kept Rena and Danka alive through Auschwitz, and what made them different from those who were not so lucky? Were they different, or were they simply lucky? 6.What compelled Rena to act so selflessly when it came to taking care of and providing for her sister? Was she acting out of the goodness of her heart, or out of necessity? 1.Pick one scene that you feel particularly strongly about and rewrite it from the perspective of one of the other people in the story—you cannot write it from Rena’s perspective because you already know what she is thinking. Write the scene so you get to know who this person is, what they were thinking, and what motivated them to do what they did. 2.Imagine what a potato peel tastes like from Rena’s description and write down your perceptions. Then take a potato peel and eat it—how does it really taste? 3.Get together some stale bread, mustard, weak tea (no sugar), a potato peel, some watered down potato soup (cold and with no seasoning), and/or some macaroni and the water you cooked the noodles in and sit down and eat. Give time to each portion of food, to taste and consider what it was like to eat almost nothing but that bread for three years and forty-one days. How does the noodle broth really taste?